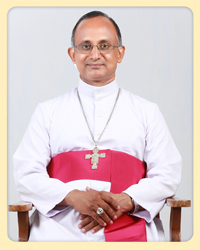 His priestly ministry started with the appointment as the assistant warden of Nirmala High School, Muvattupuzha (05/01/1981- 15/05/1981) and then as assistant parish priest at the Cathedral (15/05/1981- 18/03/1982), Arakuzha (18/03/1982- 19/03/1983), and Paingottoor (25/03/1983- 28/08/1984) parishes. When he was assistant at Paingottor parish, he also had the charge of the parish priest of Punnamattam. In 1984, he was sent for higher studies and in 1989 he secured from the Oriental Institute in Rome his Doctorate in Canon Law on the subject: "The Catholic Bishops' Conference of India (CBCI): An Inter-ecclesial Assembly". As he returned, he was appointed the parish priest in charge of Thennathoor, Neriamangalam, and Bethel successively. He was also the notary of the Eparchial Tribunal and later served as the Defender of Bond and continued as an Eparchial Judge. He was appointed as the first resident parish priest of Njarakkad (23/04/1990 to 15/05/1993).